I like radishes–the fresher the better and we had them coming out of our ears after everyone bought them at the market on Saturday–about five bunches of munchies. However there is a limit to how many sharp little explosions in the mouth one can take–even if, as it’s said, they are good for the digestion. Our guests took a fortifying bunch with them on their travels on Sunday morning, but there was still a pile left in the fridge yesterday. What to do with them..? 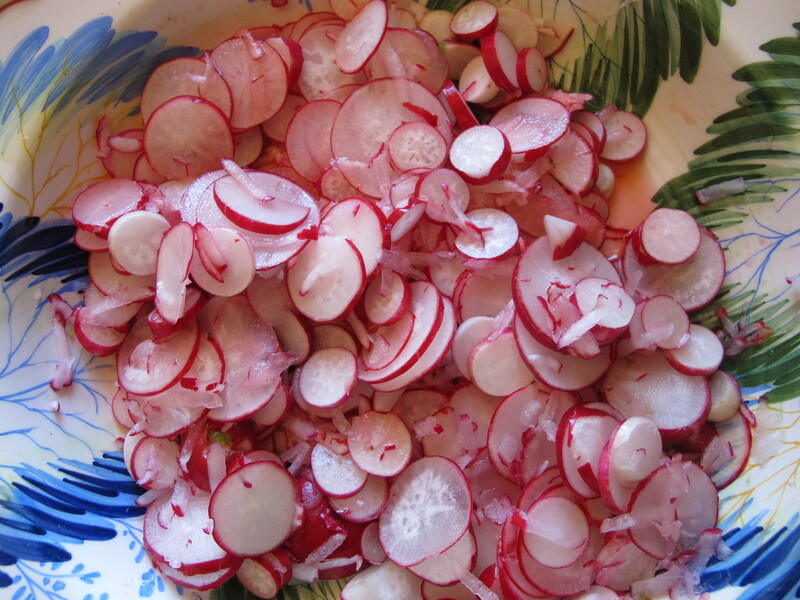 Mix the radishes with the lemon juice and salt in a bowl. Add the parsley, diced celery and spring onions. Sprinkle over the olives and the olive oil. before turning it over carefully but thoroughly. A green salad, some soft local goats cheese and a spoonful of the tapinade I’d made on Saturday, went well with it at lunch. Pleased to know you are back in harness again. Radishes are one of the best things for children to grow because they are quick growing. Lucy (granddaughter) is anxiously watching the spot where she sowed hers, but no sign yet. Oh well, she is learning patience too! I have just assembled all ingredients on my kitchen counter. I thank you for giving me a new light dinner recipe! Now I know what to do with all those radishes when they come up in the garden! Never been a big radish fan myself, but husband likes them and they are good markers for the carrot row before the carrot tops emerge. Will definitely give this a go in a few weeks. I just wish we could get the lovely jarred tuna in your picture. on May 1, 2012 at 5:51 pm | Reply Henriette Courtade, professeur d'anglais au collège jean jaures à Castres. one thick slice of salted pork liver,* cut up in dices and fried in a spoon of olive oil then deglazed (?) déglacé with a spoon of wine vinegar. Pour over the raddishes and artichokes and add up vinaigrette to your liking. PS i caught a glimpse of you and your friends, in the vent d’autan, on the market place, saturday morning ! We all enjoyed those big crispy red raddishes on our family Sunday lunch., too ! 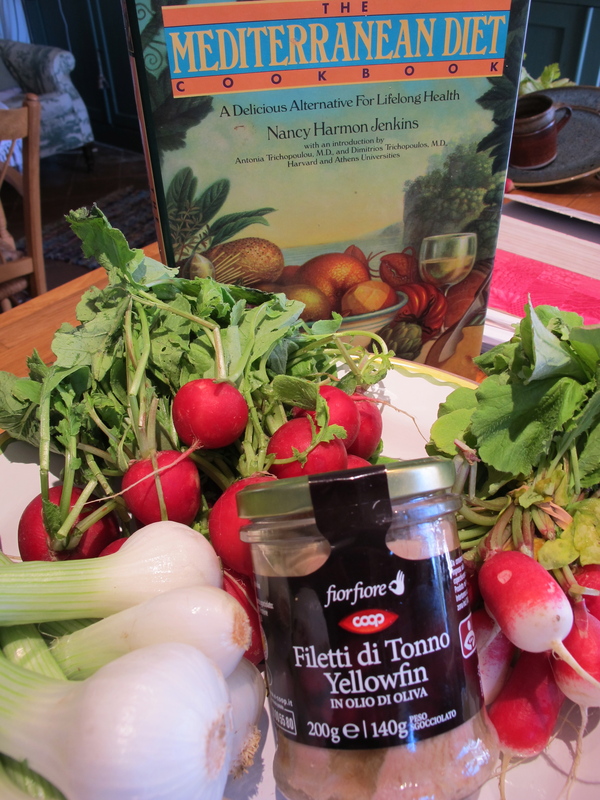 Sounds delicious, Henriette–thank you. I like the sound of artichokes and radishes together. I have never tasted salted pork liver; I will ask my butcher in Lautrec about it. “En bouquet”–c’est a dire quoi, exactement? on May 1, 2012 at 5:53 pm | Reply Henriette Courtade, professeur d'anglais au collège jean jaures à Castres. Sorry for the funny double ” d ” on radishes !! 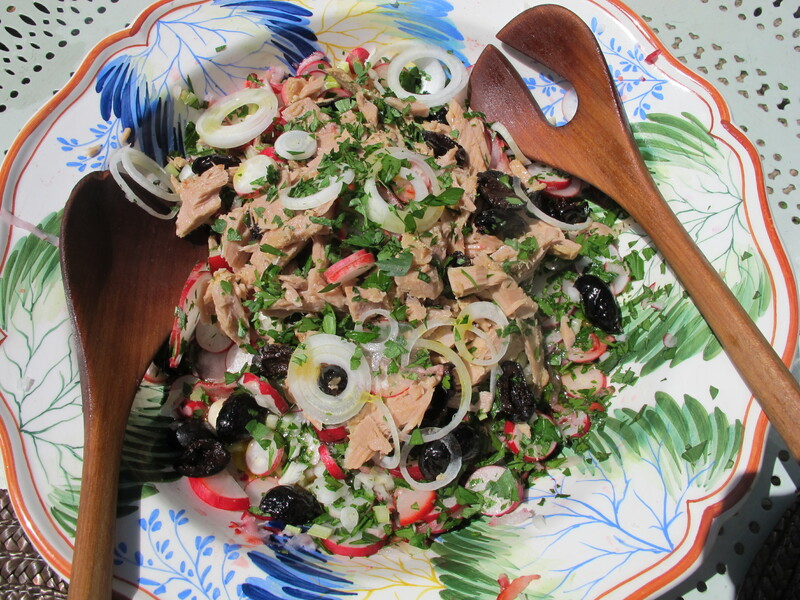 The salad looks lovely, but did you know that radishes are also delicious cooked? It takes the bite out of them and leaves a delicious, delicate flavor. My preferred method is braising: Saute a little shallot and thyme, toss in whole radishes and water to cover, plus salt and pepper. Simmer just a few minutes – they cook fast. You can toss the leaves in to cook for the last minute or so. Serve plain or reduce the cooking liquid for a sauce. This looks so fresh and colourful, just like spring.Yesterday (Monday ) was a lovely warm sunny day “er up north” but today it damp dull and down right miserable so this would cheer things up. But may I please change the tuna, for salmon or mackerel? don’t like tuna. Thank you, that sounds like a excellent salad for summer when we get our radishes. Come to think of it summer is almost here.